We plant a new border of standard roses and hybrid teas each year which are available from January 1st. 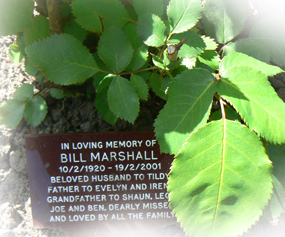 For each rose we provide an inscribed plaque and a spiked vase for freshly-cut flowers. A replacement plaque can be purchased in the future, if required. Our aim is to maintain the overall look of the rose gardens and we therefore request that you do not attached anything to the rose bush or standard, except of course for flowers contained in the vase provided. The lease of the rose bush is for 10 years. This is not renewable as the bed is replanted at the end of the period. However, you are welcome to arrange another rose in the new area.